OTTAWA - Veteran Bloc Quebecois MP Andre Bellavance announced Monday that he too is quitting the embattled sovereigntist party because he can't work with its new leader. He becomes the second of the formerly four-member Bloc caucus to bow out in recent weeks. Bellavance said he will serve the rest of his mandate as an Independent and won't seek re-election in 2015. Bellavance said his decision to leave the party came after a recent meeting with Bloc Leader Mario Beaulieu, the man who beat Bellavance for the party leadership in June. The Bloc has been in complete disarray since Beaulieu's arrival over his approach to running the party. Beaulieu has pushed sovereignty as the main electoral theme even as polls suggest the appetite for it is waning. Beaulieu has also been critical of past Bloc leaders, accusing them of having a defeatist attitude towards sovereignty. The new Bloc leader said in a statement that Bellavance has been thinking about his political future since the leadership vote and has never responded to attempts at reconciliation. Bellavance has represented Richmond-Arthabaska since 2004 but the 10-year veteran said that he no longer felt at home in the sovereigntist party under Beaulieu. He said he simply could not work with Beaulieu going forward. "I no longer felt comfortable with this team," Bellavance said. "I don't feel that we are going in the right direction." Bellavance also denounced a "purity test for independence" that has taken place within the party to determine members' commitment to sovereignty, saying that it had made him feel like an outsider. "It made me feel like an impostor and an intruder within the Bloc," Bellavance said. He noted an "unhealthy atmosphere" within the party and described two very different political outfits: the Bloc Quebecois that existed "before June 14" and the one "after June 14" with Beaulieu at the helm. With Bellavance gone, the ranks are thin for the embattled Bloc with just two sitting members in the House of Commons — Claude Patry and Louis Plamondon. Patry, who defected from the NDP, has already announced he won't run again in 2015. That leaves Plamondon, the Dean of the House since 2008 and an MP since 1984. He has said he intends to run again. Plamondon would be the only one to run under the party banner from the 2011 campaign that saw the party decimated and reduced to four seats from 47. Bellavance, 50, said he won't seek to join another political party and the former political attache and journalist hasn't decided what he'll do next. He said the recent departure of Jean-Francois Fortin triggered reflection about his own future. Fortin quit the party, criticizing Beaulieu's leadership as one-dimensional and uncompromising. 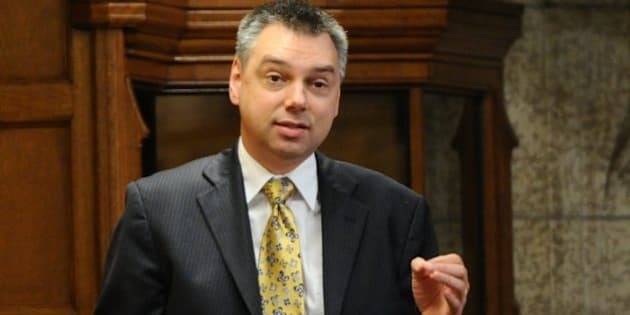 For Beaulieu's part, he downplayed Fortin's harsh criticism and accused the MP of showing disloyalty to the party and the sovereigntist cause. A statement by Beaulieu indicated he isn't surprised at Bellavance's decision. "Mr. Bellavance has been thinking about his political future since the results of the leadership convention," Beaulieu said. "Unfortunately he never really responded to our attempts at reconciliation." He added that he wants the Bloc to continue to represent Quebec's interests in Ottawa as well as promote sovereignty. "I knew from the start this wasn't going to be easy. This morning the hill just got a little steeper but it would be underestimating the resilience and determination of the independence movement to think that we will not reach the top of the hill. The situation is now clear and those who have decided to give up will not slow us down." How Much Are Federal Politicians Making?